Medellin is one of the most beautiful cities in the world, making it a top vacation destination among tourists from around the world. With a population of about 3 million people, Medellin is the most progressive and second largest city in Colombia. Locals here are very hardworking, sincere, and friendly and are ready to lend a helping hand to strangers. Here, you will find a lot of beautiful parks, museums, shopping facilities, great transportation facilities and much more. Known as the capital city of the department of Antioquia, Medellin is a perfect travel destination for those looking for a relaxed and fun filled vacation experience. The city was voted the Innovative City of the Year in 2013 by The Wall Street Journal. Medellin serves as a major destination for tourists and for this reason, there are lots of good hotel accommodation, convenient transportation method and great restaurant options to choose from. The weather is just so perfect, so there is no need for air conditioning. Book for cheap flights to Medellin, Colombia. Medellin international Airport which is also known as the José María Córdova International Airport (MDE) is the major airport in Medellin that serves all major domestic and international routes. The airport is named after a Colombian army general, José María Córdova, who was a native of Rionegro City. Located about 30 minutes from the municipality of Rionegro via the Las Palmas Expressway, Medellin International Airport is the second biggest airport in Colombia after the El Dorado International Airport in terms of infrastructural facilities. It is also the 3rd busiest airport in the country, as over 2 million passengers fly in and out of the country through the airport annually. Jose Maria Cordova Airport has a long runway and is served by several major airlines. The airport passenger terminal has been renovated a number of times and currently undergoing an expansion process. There are several safe, low cost transportations method at the airport including the Airport Taxi, Airport Micro Bus, and Taxi Collectivo which is a shared taxi that takes about 3 other passengers. Getting to the city center can’t be any easier with these convenient transportation options. The airport also has close proximity to several hotel accommodations where travelers can enjoy relaxing moment just after a tiring and stressful trip. Find cheap airline tickets to Colombia. Medellin has a moderate climate and experiences two main seasons which can be classified as the wet season that lasts from March through May and September through November, while the other is the dry season which occurs from December to February and June to August. If you are looking for the best time to visit Medellin to enjoy great moments, you should consider visiting during the dry season. This period doesn’t imply there will be no rain at all, there will be irregular showers of rainfall at this time. If you are considering the weather, then this is the best time for you. Although the crowd will be much as it is considered the peak tourist time in Colombia, but you are definitely going to enjoy massive fun and excitement while vacationing in the city of Medellin. cheap flights to Medellin, Colombia. 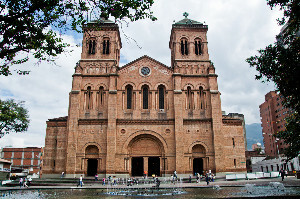 The cheapest international flights to Medellin are on Mobissimo, the free travel search engine. In addition to cheap international flights to Medellin, we help you find the best rates to both major and boutique hotels in Medellin. Consider flexible travel dates when looking for the best fares to Medellin, off-season travel or off-peak hours, or mid-week flights are all good options to lower your airline ticket fares. Consider also flying to other international airports in Colombia : San Andres Island, Apartado, Arauca, Armenia(CO), Barranquilla, Bucaramanga, Bogota, Bahia Solano, Caucasia, Cali, Condoto, Cartagena de Indias, Cucuta, Barrancabermeja, El Yopal, Florencia, Ibague, Ipiales, Leticia, Monteria, Manizales, Neiva, Otu, Puerto Berrio, Pereira, Pasto, Riohacha, Santa Marta, Tumaco, Quibdo, Valledupar. Mobissimo is also available on Facebook , Twitter, and other social networks, and our blog post fantastic flights deals to Medellin daily.